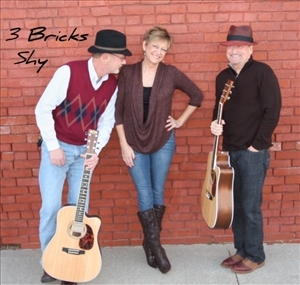 3 Bricks Shy is an acoustic trio with a style that crosses genres including Folk, Rock, Blues, Jazz, Country, Americana and Pop. Their debut self-titled CD has been receiving very positive reviews. 3 Bricks Shy is an indie band which means we rely on the folks that like their music to help support and promote them. If you like what you hear please supporttheir efforts by telling a friend or buying a song!